The Cranleigh Rotary Club's second Parish Boundary Challenge, to walk or run around the Cranleigh Parish Boundary, took place on Sunday, 8 May. The runners covered an extended course to make it up to a full Trail Marathon and Half Trail Marathon. The walkers could choose to follow a northern route, which was 10 miles long and finished in the Cranleigh Show Ground, or a southern route, which was 13 miles long and finished in Snoxhall Field. The winner of the Trail Marathon was Ally Watson and the leading female runner was Zophanie Vazquez-Howard. The winner of the Trail Half Marathon was Sam Blanshard, with Ashley Balachandran crossing the line as the leading woman. 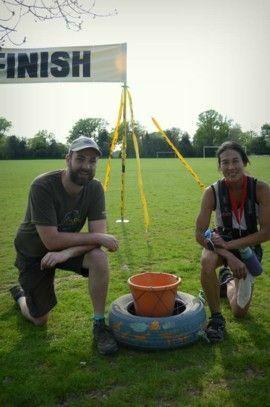 Perhaps the most amazing competitor was Rima Chai, also known as The TyreLady,who made the challenge of completing a trail marathon even tougher by dragging a car tyre around the entire course. Rima is on a mission to complete 100 marathons dragging a tyre, all before the year 2020. The Cranleigh Parish Boundary Challenge was her 60th such marathon, all designed to raise awareness of important environmental issues. See http://www.tyrelady.com/index.html and photo opposite, with Martin Bamford of Informed Choice. Every participant received a bespoke medal. The event raised over £1,000 for the Cranleigh Rotary Youth Project, enabling us to send children from St Joseph’s Specialist School for a day out at the Chessington World of Adventure. The school caters for children between the ages of 5 – 19 with moderate, complex and severe learning difficulties. In addition, it will enable students to attend the Rotary Youth Leadership Award scheme and other Rotary District, Regional and National Youth Competitions we support: Youth Speaks, Young Musician, Young Chef, Young Photographer, Young Writer and Technology Tournament. Other organisations supporting the event included Informed Choice, Cranleigh Runners and Cranleigh Sunflowers. See also the CPBC website: http://www.cranleighchallenge.uk/ .